Kate believes that every body can connect to yoga, because you do not do yoga, you live yoga. Yoga is every breath you take, every kindness you offer, every tear you shed. Yoga is a way of living, of being, of becoming. Kate began practicing yoga in 2000, after writing it on her new year’s resolutions list. She thought it would help her to lose weight and become a human pretzel. Neither of those things happened, but she did find it helped her to turn down the volume on the broken record in her head that reminded her of her shortcomings on a hourly basis. After a long affair with hot yoga, Kate took a break from her mat to become a mama. She found her way back through classes at the Y, where she met a teacher who looked like her. 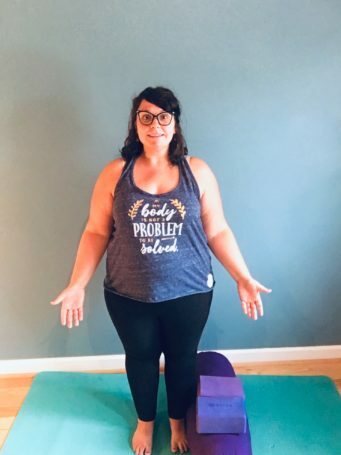 It was revolutionary for her to see a fat woman teach yoga. Her home practice grew and so did her mind and spirit. Kate came to ACY as a student and after her first class, she knew she had found some serious yoga magic. She took the plunge into yoga teacher training in the summer of 2018, and graduated from ACY’s 250hr YTT in December 2018. She is excited to share her passion for body liberation, yoga, and being in community- join her on the mat Monday’s at 8 pm. This class is designed for people living in larger bodies – with the foundational belief of this class being all bodies are good bodies and all bodies are yoga bodies. Students will be guided through a gentle flow sequence aimed at bringing your focus into your body, with love and without shame. Props will be used. This is an opportunity for people that identify as fat (large, chubby, voluptuous, curvy…etc) to celebrate their bodies as they are in this moment in community with others. Students are invited to give themselves permission to go deep, be curious and discover what gifts your body is offering you in this moment. Meditation, chanting, joyful movement, and sharing space with other like-minded folks may occur. Join Kate in a yoga practice that welcomes you, a perfectly imperfect human, to move, laugh, shift, and make space for all that you are. *This class is designed to be a safe space. If you do not personally identify in this way then please consider taking another class.